It has been long journey of repurposing the pallet wood on our website. We are the flag bearers of the protection of trees indirectly and we strongly discourage and condemn the cutting of trees by recycling the wooden pallet. We have worked on hundreds of pallet projects so far and all of them are being used practically in our daily life. Once again we are going to discus some other furniture plans like these easy chairs which are perfect to be placed in your patio or near the swimming pool to have some sun bath. 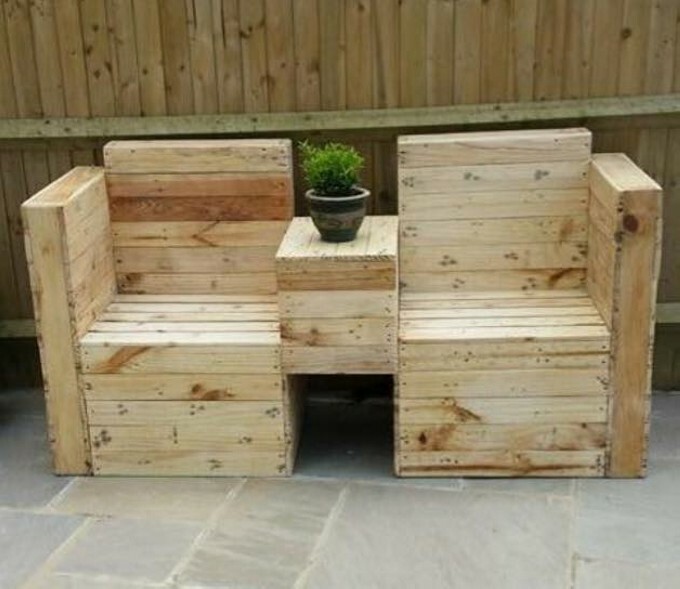 The next model is a pallet repurposed sofa which is two seated. This is entirely made of pallet wood and nothing else as timber is used in its making. Its seats are pretty spacious even for the bulky ones. They would be quite easy sitting on them while the inner table like space can also be used as armrest and also to place some vase or a planter to further enhance the beauty of the sofa. Its unique shape permits you to place it anywhere in your entire premises. But in my opinion they would look great lying in your patio. Here is another decent sitting arrangement. 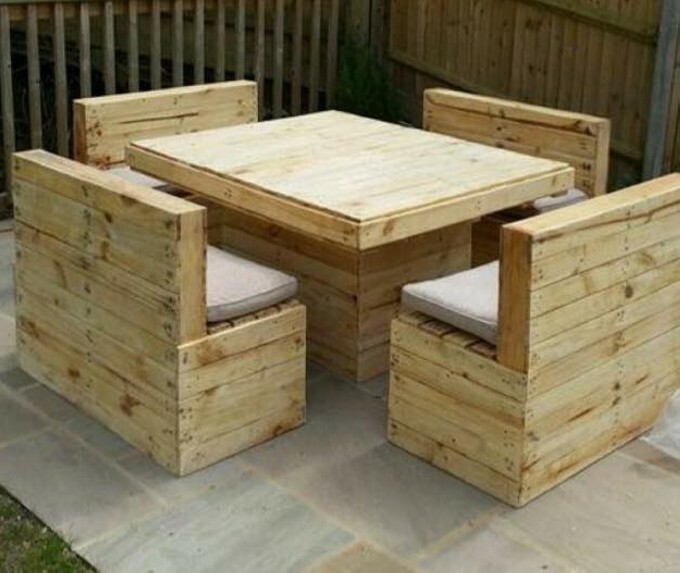 Here you can see four two seated pallets made sofas or benches, along with a robust center table. This is a whole lot of fun space for your friends and family. 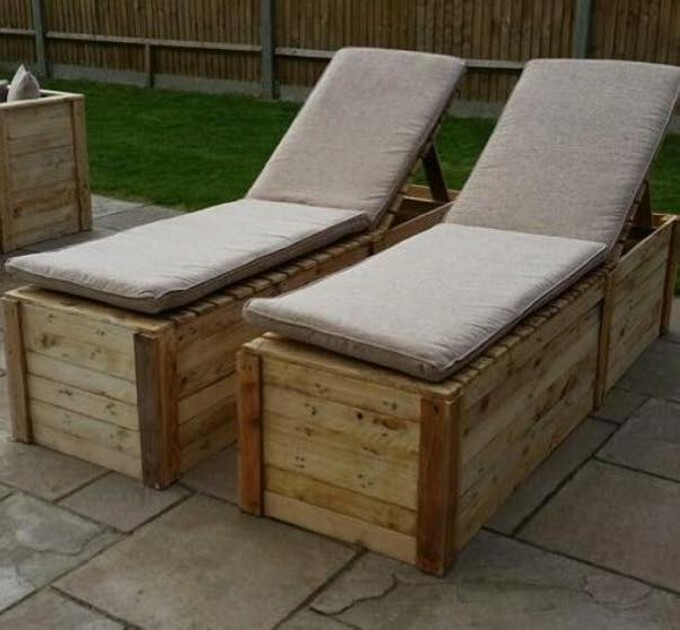 Who ever is going to be seated in here would definitely adore your effort for making this pallet furniture master piece. As the entire set is left unstained in its natural rustic color, while enough of sanding has been done to make its surface smooth. So because of its rustic look, it is a perfect sitting arrangement for any outdoor venue like your patio or even your garden.